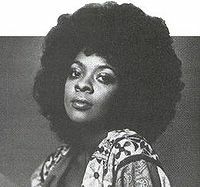 Thelma Houston (née Jackson; born May 7, 1946, Leland, Mississippi) is an American singer and actress. She scored a number-one hit in 1977 with her cover version of the song "Don't Leave Me This Way", which won the Grammy for Best Female R&B Vocal Performance. Q: Several artists have recorded versions of The Smiths or Morrissey. Have you had a chance to hear some? What is your opinion about them? A: Of my solo songs, there are versions of Nancy Sinatra, David Bowie, Chrissie Hynde, Marianne Faithful and Thelma Houston. I kneel down every day and thank God, because it goes beyond my dreams. David Bowie took me one night to his studio in New York and played a version of one of my songs. I cried for a week. Of anything for what I have prayed in my life, I never imagined that I would be given so much. The cover was also included in the intermission playlist played before Morrissey's concerts. ↑ Thelma Houston Wikipedia page. Wikipedia. Retrieved from wikipedia.org. ↑ Morrissey statement / San Diego date (May 22) - true-to-you.net. Morrissey-solo. Retrieved from morrissey-solo.com. This page was last modified on 16 April 2013, at 23:11.